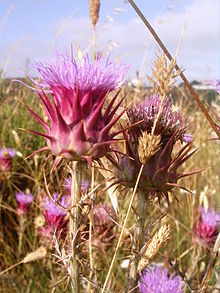 Type species: Cynara cardunculus L.
Bourgaea Coss., Notes Pl. Crit. : 39. 1849. Cinara Mill., Gard. Dict. Abr. ed. 4 (sub Artichoke) (1754). Linnaeus, C. 1753. Species Plantarum, Tomus II: 827. For more multimedia, look at Cynara on Wikimedia Commons.